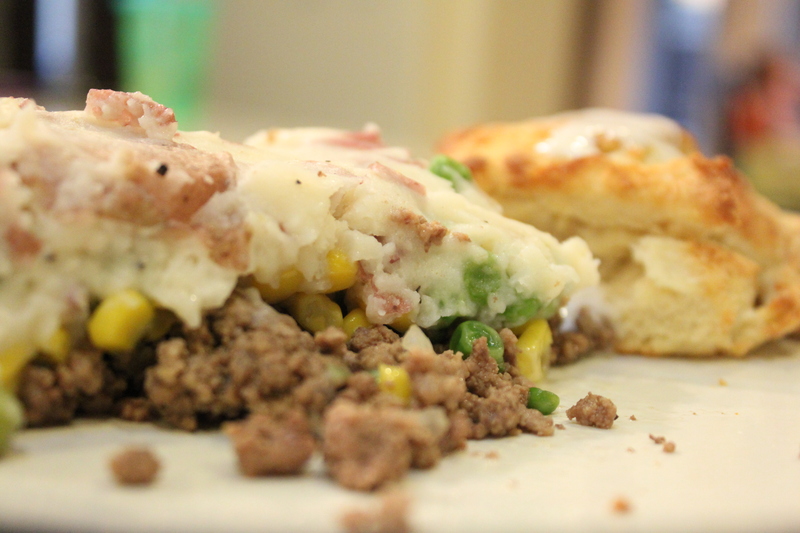 Shepherds Pie was originally created in England and traditionally made with lamb or mutton. What is mutton you may ask? An old or mature sheep, unlike lamb, the meat tends to be tough and needs much longer to cook. I have never cooked with lamb myself but I am willing to give it a try if anyone has a great recipe they’d like to share. This comfort casserole was inspired by a meal my mother-in-law recently made. I was looking for a unique recipe for last months session, Gluten-Free Cooking. I know many of my friends with celiac disease feel like their options are few when it comes to variety, hopefully this helps. Veggie layer: To prepare mixed vegetables: using a bag of frozen peas, corn and carrots and saute with 2 tablespoons EVOO, salt, pepper and garlic. Set veggies aside and prepare the rest of the dish before you assemble. Beef layer: Saute chopped onions in the rest of the EVOO, once tender add ground beef, garlic and brown. Once beef is browned, drain well then add in tomato sauce, salt and pepper to taste. To prepare potato layer: Dice potatoes in half inch cubes and boil in salted water until tender. You can peel the potatoes or leave the skins on for added texture. Once tender, drain and add back into the pot. Then using an electric mixer beat potatoes, milk, 3 tablespoons butter and sour cream on medium-high speed until smooth and creamy. Add salt and pepper to taste before assembling casserole. Assemble pie: grease a 9×13 baking dish and layer your casserole. First layer the bottom with the meat, then add the vegetable mix and top with the potatoes. Finally add the last tablespoon of butter to the top, salt and pepper and place in the oven. Bake for 35-45 minutes or until the top is golden brown. notes: If you wanted to stay true to the original shepherds pie recipe you would use ground lamb instead of beef. You can also add carrot in your veggie mix and fresh parsley. If you don’t have an intolerance to gluten then serve with buttermilk biscuits and enjoy. … hope you have a great weekend and don’t forget to send in your favorite lamb recipes!